Sadly, I have been working on ordering Mom's rose bushes since she passed away in 2015 and it has not been an easy undertaking. First, I had to find the hybridizer, who then had to find the original Lynn Anderson Rose Bush in Nowhere, California. They then started the process of growing the bushes for me and our expected date was Spring 2018. So our plan is to wait until the winter time and walk the fields. At that time they will decide whether to scrap the whole lot, or if possibly we can pull 100 or 200 that might have withstood this disaster. If there are survivors, they will ship to Nashville next Spring as planned, but I will use them for installations locally as they will need to be fussed over for a few years. Woodlawn Funeral Home, where Mom is interred, is hopeful we can carry on with our plans to create a Lynn Anderson Rose Garden there on the grounds next Spring! I am also hopeful to create a Lynn Anderson Rose Garden in my quiet neighborhood in Nashville of possibly 50 roses. So the survivors of this first batch will be enjoyed and will go to homes that can attend to them and any sensitivities they might have. For folks who want a rose in their gardens, I have placed a replacement order for a fresh growing batch to be commenced next Spring when budding season starts. These roses (fingers crossed) will be ready Spring 2020 to ship to our friends and customers across America. 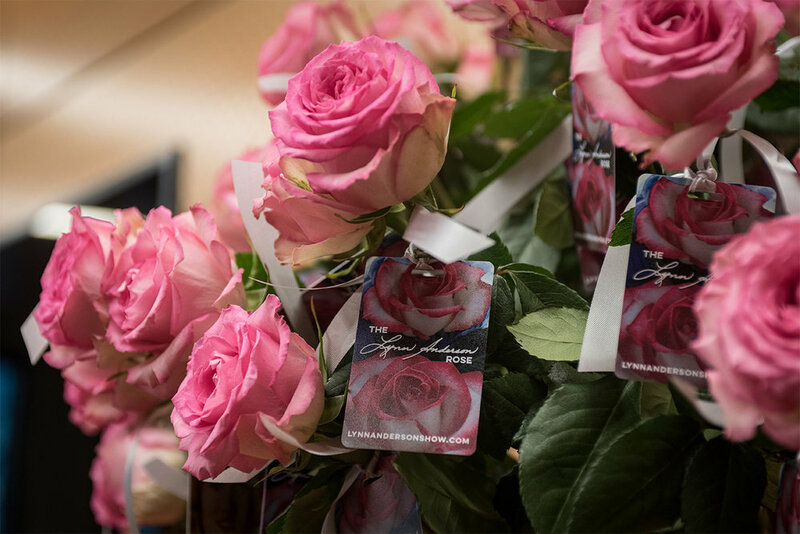 Unfortunately, you will be waiting a little longer, but our guarantee and hope is that you have a perfectly healthy & happy Lynn Anderson Rose Bush that will grow strong for years to come. The picture of roses you see in this article look a lot like Mom's rose! I made gift tags with a reminder date of 2020 and gave everyone who left the opening at the Country Music Hall of Fame last week a long stem rose as a gentle "Keep Me In Mind" reminder. The Hall of Fame's exhibit is called "Keep Me In Mind" and everyone left with a Lynn Anderson Rose. It was a fitting tribute to my "Rose Garden" Momma. PS ~ Be careful with sprays and pesticides! The Lynn Anderson exhibit at the Country Music Hall of Fame opens September 15th and we have been preparing an awesome display horse for Lynn's Grandmother's Parade Saddle. I worked with artist, Ellen Summers, to create the life-sized, Quarter Horse Palomino. It's covered in Roses and Rhinestones! The horse & saddle are set to make their debut Sept 15th.